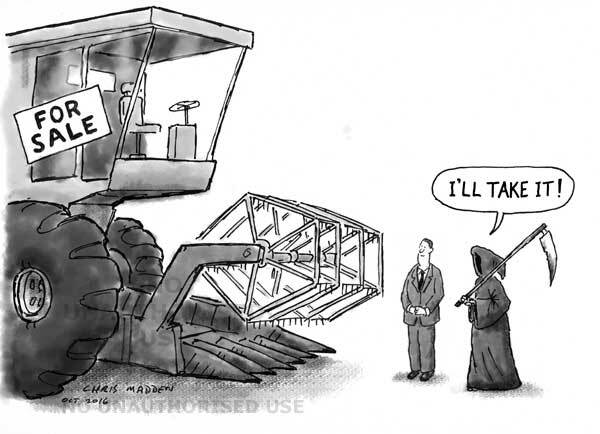 The personification of death in the form of the grim reaper upgrades from his scythe to a combine harvester. The harvester is here a symbol of much greater ‘harvesting’ power than the scythe – in other words a means of achieving a much greater death toll, similar to a weapon of mass destruction. 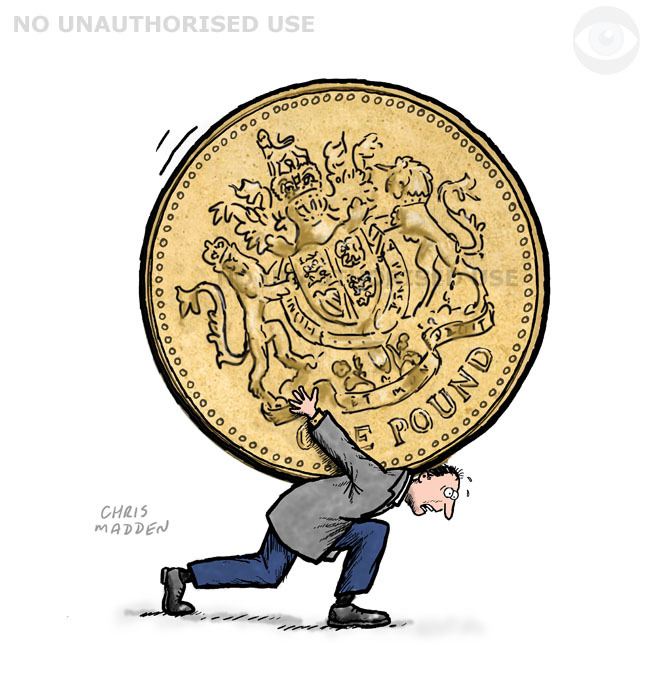 A man carrying a giant coin – burdened down by financial problems. Also a metaphor for the burden of living within a society in which the acquisition of financial wealth is seen as a primary goal above all others. The giant coin (here a British pound coin) is a symbol of finance in general, and of people’s dependence on the financial system. A cartoon about money, finance, capital, capitalism, pursuit of wealth, the economy. Adult colouring book cartoon – the Henry Ford Colouring Book. 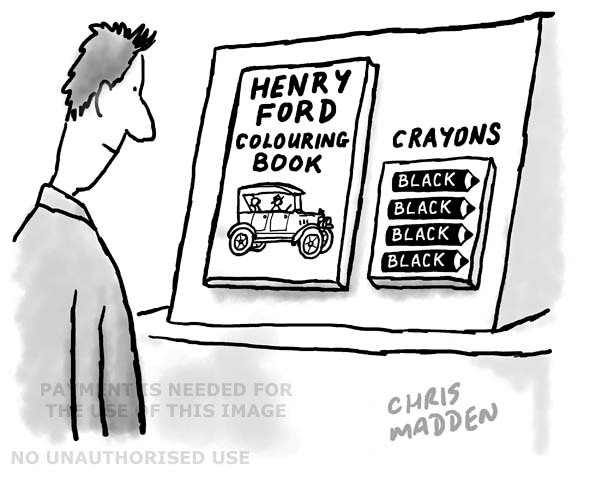 A cartoon showing an adult colouring book called Th Henry Ford Colouring Book. There is a set of crayons or coloured pencils with the book. All of the colours are black. A cartoon about the publishing phenomenon of colouring books aimed at the adult market. 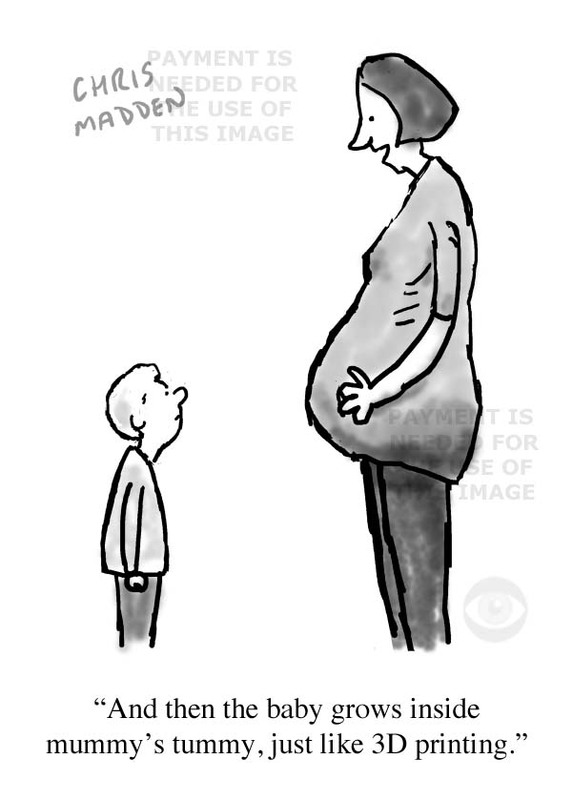 This cartoon, of a pregnant mother explaining the facts of life to her young child, illustrates the use of metaphors for contemporary technological processes. 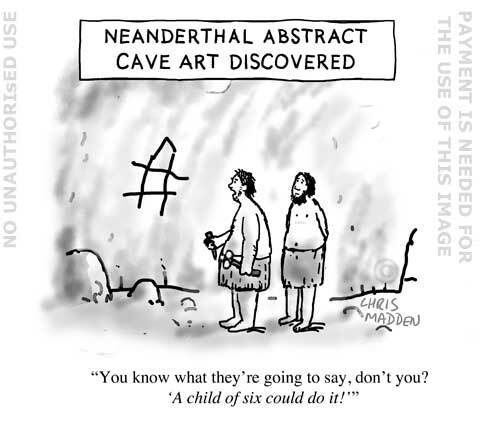 The idea is that young children are more likely to understand modern metaphors than older ones. A cartoon about the facts of life, where babies come from, the birds and the bees, 3D printing technology. A chessboard on which the chess pieces are not only black and white but are also shades of grey. 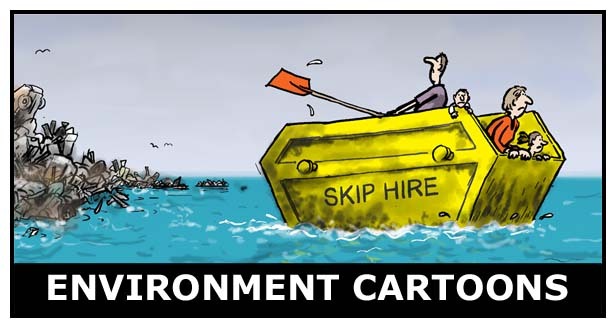 The idea of the cartoon is that conflict occurs when things are seen in black and white or when people are polarised in outlook. 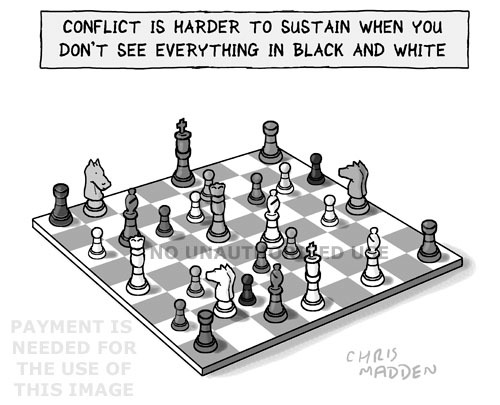 With shades of gray or nuances of opinion conflict is less likely – specifically as on the chessboard in the illustration. 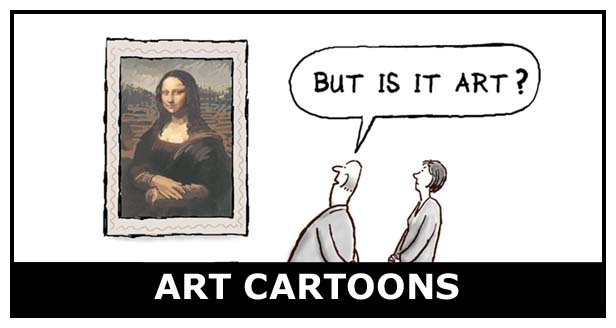 The cartoon is a comment on the fact that people tend to analyse things in black and white, as “either/or” or in binary. 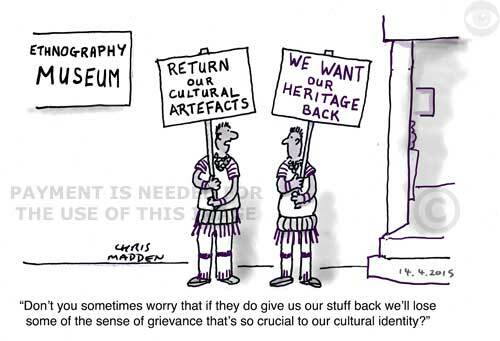 The cartoon shows the issue of the repatriation of cultural artefacts from museum collections as one about cultural identity. The inspiration behind the cartoon was the debate about the return of the Elgin Marbles or Parthenon Marbles from the British Museum to Greece – a debate that has sometimes been used by greek politicians to bolster Greek national identity (and their own careers?). 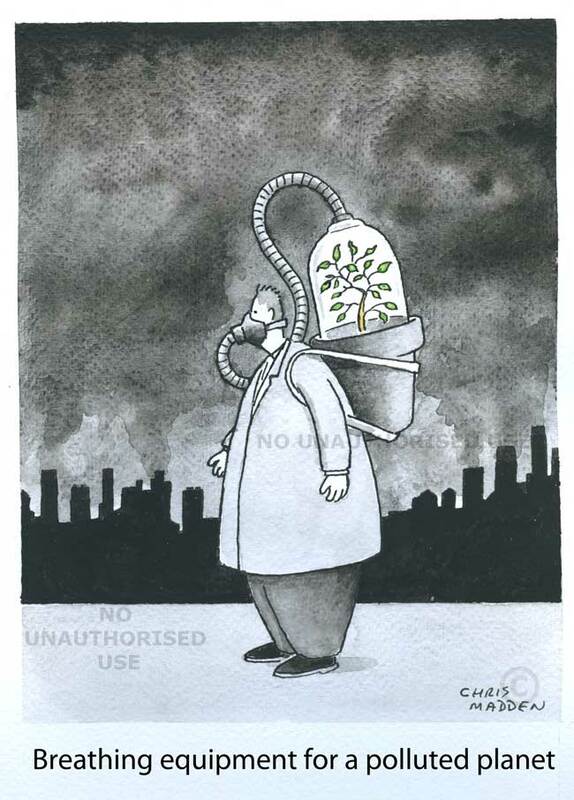 The cartoon also looks at grievance culture – the issue of identity generated through a sense of grievance. A cartoon about ethnology, ethnography, enthographic or enthnological museum collections. The art, in the form of stone engraving, is estimated to be about 40,000 years old. A hammer nailed down. Did the nails nail down the hammer to stop the hammer hitting nails? The hammer is a metaphor for a tyrant (perhaps), or at least an oppressive force or feared presence. The hammer seems to have been attacked by nails, perhaps because hammers normally ‘attack’ (or at least hit) nails. Are the nails there to stop the hammer hitting more nails and thus committing more violence? Or was the hammer nailled down by another hammer? In the cartoon the coach from the Magical Mystery Tour has come to a stop at the top of a rainbow, which is a reference to the hippy psychedelic drug culture that was prevalent at the time of the two films. The Beatles are standing on the rainbow, with one of them asking “What did you put into the sat-nav John?”. Part of the joke in the cartoon is that sat-navs (GPDs) didn’t exist at the time. There’s also a double meaning it the phrase “What did you put into the…” as this can refer to putting hallucinogenic, pychotropic drugs such as LSD or other mind-altering drugs into such things as drinks, cakes etc. 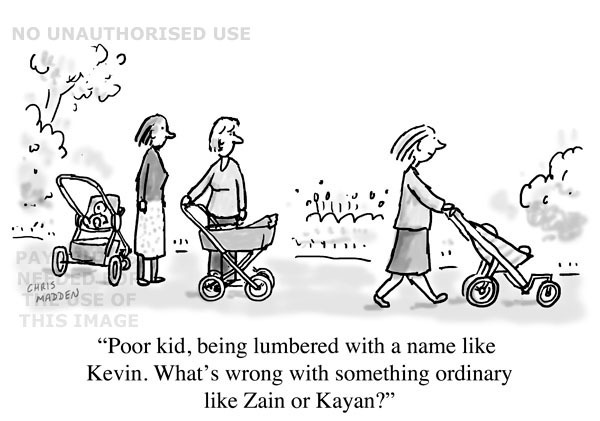 A cartoon about the way that the words ‘was like’ have replaced the word ‘said’ or ‘thought’. A cartoon about linguistics, modern English, young people’s language, standard English, non-standard language, Queen’s English. A cartoon about punctuation, showing medieval monks or scribes writing manuscripts. One monk is saying to the other monk “I’ve just invented the question mark”. The second monk is answering “Why” (without a question mark, because up til then question marks didn’t exist). A cartoon about press regulation or media corruption. And possibly about government and business interference with the media. Should the press be self regulating or should they be controlled? And by whom? In a police state, press control would be a bad thing – but what about in a democracy? The cartoon may be used to illustrate the Lord Justice Leveson inquiry into the press which is investigating media activity (especially linked to phone hacking). The cartoon shows a person looking out through a panel in a newspaper. The meaning is meant to be slightly ambiguous. Is he on the inside or the outside of the press? He looks a bit like a spy. Is that a good thing or a bad thing? Are the regulators good or bad? It depends on the country or regime under which they operate. 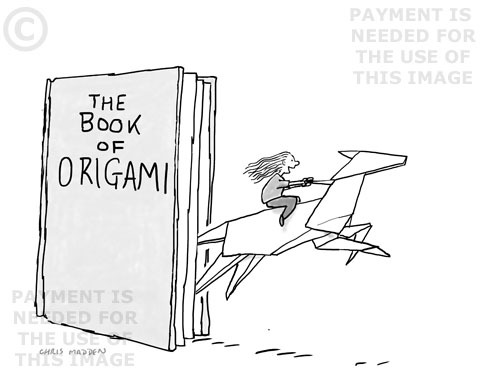 The origami horse in this illustration represents the horses depicted in children’s fiction aimed at young girls. The horse is made out of folded paper that represents the pages of children’s fiction. The way that the child is riding off on the horse (almost flying) represents the flights of fancy and fantasy created by fiction and literature, and the sense of adventure and escapism. A cartoon showing the popular tabloid press overshadowing and obscuring serious news stories and reporting. The public cannot see the important news stories because they are hidden behind the trivia of the pop press. 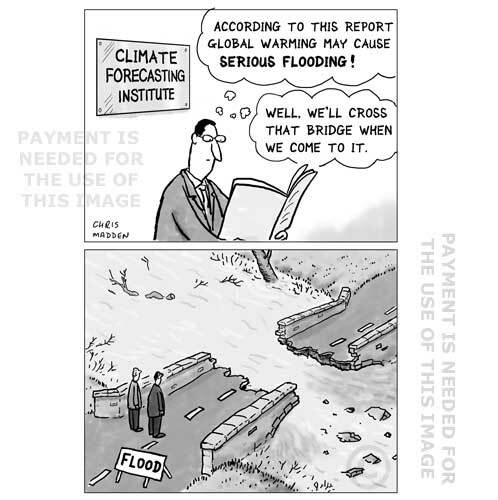 This cartoon isn’t so much a criticism of the popular tabloid press as an observation of how things are. I usually find myself reading the ‘human interest’ stories in newspapers when I think that I really ought to be reading more weighty articles. It’s what we find interesting. Optical illusion. Old hag or young woman? Optical illusion cartoon. Do you see a young woman or an old hag? The drawing is an example of ambiguous visual information that can flip from one interpretation to another. My own feeling is that it’s normal to see the image as being of a beautiful young woman first. The old hag is only seen after a bit of searching. There are several possible reasons for this. One is that people (especially men?) have a tendency to notice beautiful young women more than ugly old hags. Another is that the image of the old hag is more exaggerated and less naturalistic than that of the young woman. I’ve tried to make the old hag more easily distinguishable by giving the two people in the image mirrors so that you can tell which direction they are facing. Cartoon showing architects in their office looking out at a cityscape that includes modern architecture and modern buildings. One of the modern buildings looks like a salt cellar. The architects realise that the builders have taken their salt cellar by mistake, instead of the architectural model. A cartoon about the trend in modern architecture for oddly shaped buildings. Such unconventionally shaped buildings include the ‘Gherkin‘ and the Shard of Glass. Not to mention Anish Kapoor’s Orbit tower and City Hall. Soon cities like London will end up looking as though they are full of modernist architecture in the form of giant kitchen utensils (the cheese grater) and cruet sets or condiment sets (salt cellars and pepper pots). 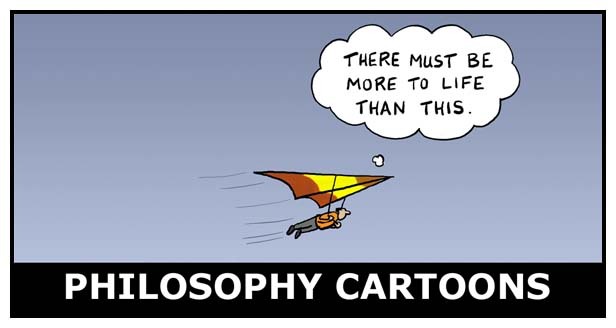 This cartoon has a number of meanings. One is that the games that children play are more serious than some people would like to think. Play is a preparation for adulthood, so playing with toy guns is in some ways an actual preparation for using real guns in adult life. 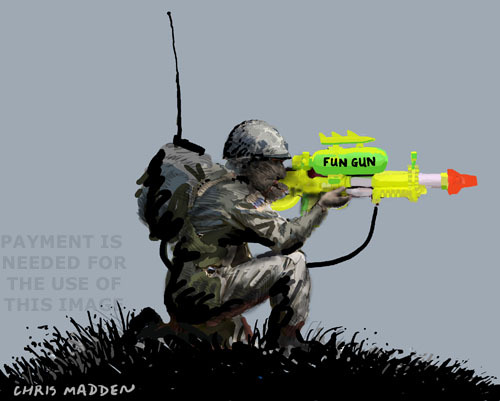 The soldier is using a toy water gun to highlight the link between childhood play and adult aggression. The illustration is definitely not a simple interpretation of the feminist phrase toys for the boys – an expression that I take strong exception to as it misinterprets the nature of play and attempts to trivialise and infantilise the male personality. While I was drawing this picture it occurred to me that it had something of a piece of Banksy artwork to it, in both its subject matter and its style, so I checked that I wasn’t just unconsciously copying a piece of Banksy graffiti, and as far as I can tell there is no equivalent Banksy picture. By the way, I’ve drawn in this style and on this type of subject for more years than I wish to remember, so there’s no question of Banksy plagiarism involved here! A cartoon about the nature of play, toy guns, warfare, male aggression, toy weapons, water cannon, male psyche, psychology of warfare, the military mind. A cartoon of Margaret Thatcher as a lion under Nelson’s Column. The cartoon includes several references to political issues of the Thatcher era. Cartoon showing the dove of peace emerging or hatching from a bomb. Artwork showing the dove of peace. An anti-war illustration showing a peace dove emerging from a bomb. The symbolism in the cartoon is that peace can follow the violence of war. 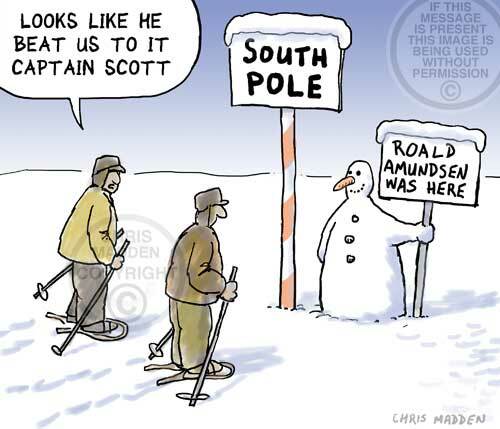 A cartoon related to the expeditions to the South Pole between Amundsen and Scott. Often portrayed as a race between Scott and Amundsen, Scott insisted that his purpose was more of a scientific survey than a race against Amundsen. Amundsen however saw it as a race, and was determined to reach the South Pole first. 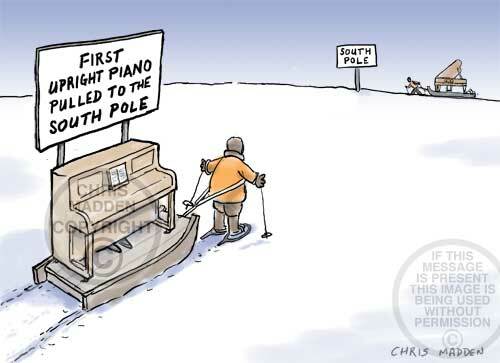 An explorer/adventurer pulling an upright piano to the South Pole as a feat of endurance. As he approaches the pole he sees that someone pulling a grand piano is about to beat him.